Oh sure, beefy sandwiches, hearty stews and stout beers are perfect food to hibernate from a February snowstorm. But springtime is an entirely different menu—less snowman physique, more stick-figure, bikini body fine. From sustenance steak to springtime salads: New to Bend, Salud! (431 NW Franklin Ave. Suite 150), has proven a welcome and much-needed addition to downtown lunch options. Although specializing in raw and vegan dishes, all are approachable and creative, like the island style collard wrap, which is packed with bell peppers, shredded carrots, red cabbage and accented with a pop of sweet mango slices, cilantro and mint. Other Source favorites include the raw falafel plate, served with raw dipping sauces, crunchy cucumber salad and sweet potato crisps. The enormous and colorful Thai Salad is also a winner. Jackson's Corner (845 NW Delaware Ave) is home to perhaps the best traditional, seasonal salad in Bend. The Market salad is always overflowing with whatever local or regional produce is available—brussels sprouts, beets, fingerling potatoes. (Full-sized, $10; half salad, $6). Natural, regional meats can be added for just a few dollars more. Best part? Jackson's is open all day until 9 pm. La Magie Bakery and Café (945 NW Bond St.) is well known for fresh breads and decadent sweets, but it also serves up a mean green plate. Choose between Cobb, Mandarin Chicken, Steak, Cesar, Quinoa or House salad. All cost between $8 and $13 and come with a soup of the day and baked-in-house bread. Spork (937 NW Newport Ave): Steak or salad? Go for both with Spork's Thai Steak Salad ($10)! Tamarind-marinated steak comes piled upon a bed of greens, bean sprouts, herbs with toasted rice powder and coconut sprinkled on top. The sweet and spicy dressing really pulls the dish together. Unlike many other salads, you won't be left wanting for more. And like Jackson's, Spork is open for dinner, until 10 pm. 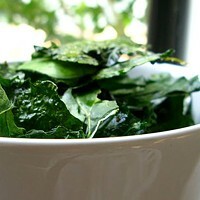 As important as what you are eating during the springtime is where you are eating. Translation: Patios! Sunshine—and all of its Vitamin D infusing glory—is the elixir of spring resurgence. Soak it up! The Old Mill has plenty of riverside patio seating including the music-poaching favorites, Anthony's (475 SW Powerhouse Dr.) and Gregg's Grill (395 SW Powerhouse Dr.), bothwith back patios facing west toward the Les Schwab Amphitheater. Although the venue is quiet for now, May will mark the first shows of the season, launching the true beginning of the summer. A newer, but equally as Bend-iconic viewing spot is the second story patio at Old Mill Brew Wërks (803 SW Industrial Way). A gorgeous view overlooking the year-old raven mural on the backside of the Amphitheater, along with an upscale pub menu and tasty local beer makes the late afternoon sunshine spot worth visiting. A bit less bucolic, 10 Barrel (1135 NW Galveston Ave.) and Brother Jon's (1227 NW Galveston Ave.) both offer excellent spots to park (not literal car parking; that's nearly impossible) for a dinner or a few brews on a spring evening. However, finding a seat can be a challenge; we suggest going during the early afternoon before the rush and avoiding weekends entirely. No shame in early afternoon drinking. While it may seem desperate in the wintertime, it is much more celebratory in spring. An affordable alternative to tourist-filled brewery patios, Riverside Market (285 NW Riverside Blvd.) is sunned the day through. Cheap delicious food and drinks, along with a friendly crew of dedicated and loyal patrons, are bonuses. Dojo/Crow's Feet Commons plaza 852/875 NW Brooks St.
Bend Brewing Company riverside patio 1019 NW Brooks St.
Goodlife Brewing side yard 70 SW Century Dr.
Crux Fermentation Project side yard 50 SW Division St. 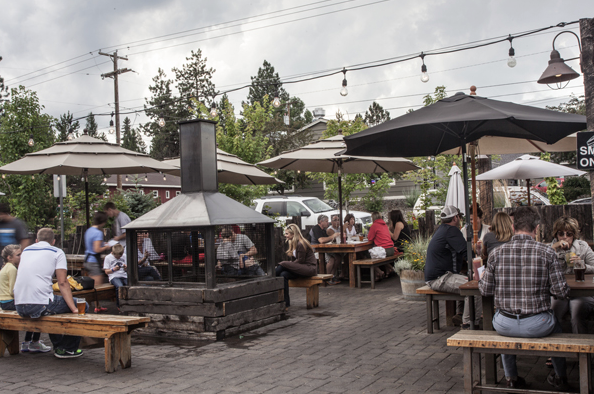 The Lot, outdoor dining, drinking and food cart pod 745 NW Columbia St.
Worthy Brewing patio 495 NE Bellevue Dr.
Parrilla après-spring-ski $1 PBR patio 635 NW 14th St. The secret to making friends in Bend: Food. Lots of food.